Please note these prices are for guidance only, each individual's needs and choice of hospital may affect the eventual total price. The surgical prices are all inclusive for the surgery, the anaesthetic and all follow up, they do not include the price of the initial consultation. The botox and filler prices include the initial consultation. Each individual hospital has slightly different all inclusive prices for surgical packages. Typical prices start at around £500 for mole removal, £3500 for upper lid blepharoplasty and £5500 for upper and lower lid blepharoplasty. I was appointed an NHS Consultant Ophthalmic and Oculoplastic Surgeon to the Gloucestershire Hospitals NHS Foundation Trust in September 2003. I have clinics in Cheltenham, Gloucester and Cirencester, and operate at Cheltenham, Tetbury and the Nuffield. Check your consultant holds a substantive NHS consultant post. This will ensure they are fully qualified and have been selected and appointed by a group of peers. I am a consultant ophthalmic and oculoplastic surgeon at Gloucestershire Hospitals NHS Foundation Trust. Your consultant should have an established track record in the common procedures offered. For rare or new procedures look for honesty. Never be afraid to find a second opinion. I've been a consultant for the last 14 years. I will only operate if I’m sure I can meet your expectations. Do you do reconstructive as well as cosmetic surgery? Only allow someone to operate on you for a cosmetic reason if they are trained to be able to reconstruct the same area. 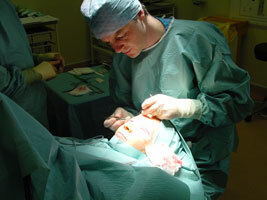 My NHS work is mainly reconstructive, please see www.oculoplastics.info for details. Look for honesty. All consultants have experienced complications. How the complications are dealt with is usually more important than the exact complication. What will you do if the result is poor? Your consultant should offer to re-operate within the fixed price if there is a clear problem. I offer this for all my patients, there is no additional surgical charge, but additional hospital fees may apply. Do you charge a consultation fee in addition to a botox or filler fee? Some consultants add the cost of the consultation to the treatment. This can make a simple botox treatment very expensive. I charge for surgical consultations, as not every patient proceeds to surgery and the day of surgery is separate from the day of consultation. For botox and fillers the cost of the consultation is included in the price. Who will I see pre and post operatively? If you are not seeing your consultant there needs to be a good reason. It is reasonable in some situations for someone else to remove your stitches. I see all my patents at every visit, unless more convenient for the patient to see their local clinic for suture removal. Are the pre and post-op photos of your own patients? Do you have information I can take away? Always useful, never decide to proceed with surgery without going away and thinking about it. I use this website for much of my patient information. It saves trees and ensures the information is easily updated. Essential. If the insurance companies will not deal with your consultant neither should you. My insurance is with PMP and HFIS.